The model in this set is a Theta-class T-2c shuttle. 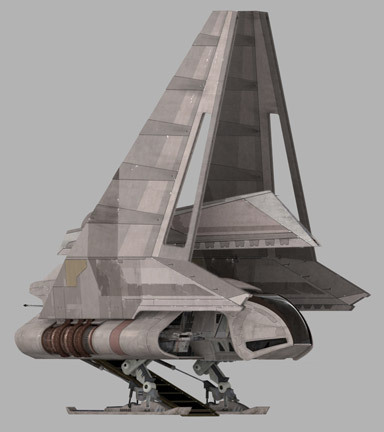 A personal carrier for influencial people that was used for a long time before it was replaced by the Lambda class T-4a shuttle. In the set, Emperor Palpatine comes to the rescue of Anakin Skywalker at the planet Mustafar situated in the outer rim. Skywalker had been defeated by Obi-Wan after a foolish strategical error (high ground advantage) and left for dead on the planet. For this mission, the shuttle was piloted by Captain Kagi. There is a small error in the set-up. A sick bay was present on the shuttle and it is there that Anakan received first treatment. The helmet however was only given later when they got to the medical facility at Coruscant. So this is somewhat of an error in the set. Below you can find how it should look like. Unlike many others it seems, I did like the ep1-3 movies as much as I liked the old ones. The scene of which this set is derived is almost at the end of the trilogy. If you're not a SW-fan and saw the movies once or twice, there's a good chance you remember what happened then... the transformation into Darth Vader and revealing of the twin babies. So I guess I had some good anticipation for this set. It seems to have some nice minifigures and it's a relatively big shuttle from a movie I like. There are 592 pieces to the set and 4 minifigures. I bought it second hand and at the moment of writing it was worth according to BP 42€. I paid a whopping 40€ for it but with that said, the entire set was complete and washed with a box in reasonably good condition. So with good hope we pour out the bags and get ready to build this shuttle! Emperor Palpatine: Pretty exclusive since the only other set that has this version of Palpatine is the 10188 Death Star. I like the design of the face. The torso is nothing to write home about. No printed pants. Comes of course with a cloak and covering of the head. It's not a bad piece, it certainly resembles the Emperor well but in my opinion, it's misses that extra something to make it less boring. The Clone pilot Captain Kagi: Unique to this set. Very well designed imo. The head looks pretty cool and the helmet compliments it well. The torso and back are printed and with much detail. The pants is not printed but at least the color of the pants is not black so very good! 2-1B Medical Droid: Also an exclusive to this set. It can count as a minifigure since it's not so generic as a battle droid or skeleton or whatever. The torso and head are special enough. The head itself again is simple but effective. They could have made it entirely gray but they decided to apply some colors for the eyes and the mouthpiece. The torso has a nice colored emblem on it which gves it that "not so ordinary droid" feeling. If only there was put as much thoughts in other droids as this one. Good work. Battle Damaged Anakin Skywalker: Yet another exclusive to this set. It also is my favourite of the set. The head has the rip and burn marks on it with a grrrrr expression on the mouth. The torso is marked by shredded clothing and burn marks and the back of the torso is printed too. It comes (albeit an error) with the Darth Vader helmet. It has 1 black and one pink hand. If you look at the picture containing the pieces, you'll see there are alot of gray pieces in it. This is not so surprizing since a large quantity of SW sets are gray. Very welcome are the red pieces in the cockpit and (and this is very exciting) the pilot even has a display to fly his craft with (if you ever read any of my other reviews, you know I kind of make a fuzz of it when it's not present. Rebrickable notes there are a total of 574 parts, with 136 unique parts/colors but when you look at it before and during the build, you wouldn't notice there are any real special pieces. I didn't build a new set, it was second hand, but so far as I have seen, there is only ONE STICKER. Which of course is very good! The minifigs save the set regarding pieces. Especially Anakin and the droid are well executed. Had there been more variation in colors of the bricks, it could have scored higher. A 6 is abit on the low side and 6.5 would be better. And now comes the less fun part. Let's start with playability. It has 1 shuttle and 4 minifigs so let us assume you only have that set to play with. Replaying the "Emperor Palpatine to the rescue" scene gets boring after 10 times. Sliding the helmet over Anakin's head is quite nice.... but slide on... slide off.... slide on... slide off.... yawn. Perhaps I am being a bit to cruel for this set but it just seems very boring to me. Perhaps it would have been better if this set was combined with another set. Perhaps add the other shuttle. Or simply a figurine of Obi-Wan... Plenty of things that could have been done to up the playability but well, the result is 8096. As far as build experience. It was fun... or at least it was the first 20 minutes when I was building the cockpit. The cockpit was well designed and honestly, I was impressed with how it turned out. The rest of the craft was a bit boring to say at least. Once more, perhaps some color variance or some interesting techniques or a more attractive sick bay and trinkets would have helped make this build less boring. In fact, instead of including a Vader's helmet and some useless (in this set anyways as you don't have anyone to fight with) light sabres, add some seringes or baxters, or a heartbeat monitor or anything! I had difficulties with the mechanism that keeps the roof on the sick bay. Perhaps it's just me of course, but it just isn't that easy to open and close. Could have been resolved by closing cargo doors like space shuttle and on top and mechanism that bends back with the tail fin on it. The wings are dull. They have too many studs showing and could have been made more smooth in some way. But I'll let those slide. What I can not let slide is the monstrousity of a wing they put on top. This is simply not done. I usually don't say things like this because I probably can't make it better, but this I surely CAN! Studs to 1 side??? What where you designers thinking. Why not just build it with slopes? It would have been more smooth and less FAT! No, I was utterly disappointed in that part and since it was at the end of the build, even more so. I think I can best compare it to studying the night before a big exam in university. The first pages of the course you study well and you can recite them without issues (minifigs, cockpit) but as the night goes on and there's a soccer match on the television, you get distracted and just scout over the pages (the rest of the set). The rating I gave it is pretty bad. The worst I gave a set I reviewed until now. It's not even mediocre. But perhaps that's a good thing too. Perhaps it just means that the rest of the sets Lego sends in our direction are generally pretty decent hence my disappointment? The set has 592 pieces and 4 minifigures. If I would have estimated the price, it would be around 59.99 and it is.... in USD. In Europe, the price was 69.99€ and that price was too high. It brings it to 11,82c/brick. It's not the worst offender price considered but I would have loved for it to be around the 10c boundary. Star Wars is an immensely popular theme but there are certain subdivisions in it. The first movie, Star Wars, was released in 1977 and episode 5 and 6 were released with a 3-year interval. Those movies are known as the OT nowadays. The first 2 movies were more popular than the last one. The people that appreciated the movies back then when they came out should be around their 50's now. The first movie of the prequel was launched in 1999 and the 2 following films were released again with a 3-year interval. The reception of these movies were far less than the first but nonetheless, people could still enjoy it. The 3rd movie was the most popular one. People that enjoyed those movies are around there 30's now and in the prime of their collecting. There are also the clone wars. A 2008 animated movie released in august (while the rest of the movies were released in may). Critics didn't like it one bit, but it still managed to be a moderate succes in the box office. In 2015, we can expect and episode 7 of these movies. Knowing Disney (and the 4 BILLION$ they paid) it will be a very large effort to continue keep this theme alive and popular. This set comes from the 3rd movie of the prequels. I have not paid attention to it when it was in the shops, but I believe you could get it about everywhere. The front of the box is nothing special. It's like 12 in a dozen. It has the star wars logo on it with the trooper in blue on the right (curses with red) and the included minifigs down left. Good thing they didn't really expose the top fin too much on the box. I also wonder why the added the sickbay on the front. It should normally be on the back I think. I guess they could have added some more life on it by setting it landed on the lava ground on Mustafar. But the back of the box already contained a landed version so understandable they put it in flight on the front. Due to the sick bay image on it, the box looks less clean than other boxes. The back of the box is more clean, showing the ship landed and the different play functions. The minifigs look good on it, the top fin is hidden. This is a good design of the back. Nice and clean or how it should be. The initial price was steep but it was able to climb 30€ which is not bad for a set released in 2012. It's not that good either, but certainly not bad. Does it have more growth potential? Why not. I believe this is the only Theta T-2c shuttle there has been and will be. Not sure though. But with the exclusive minifigures especially the one of Anakin, it could go a long way. It will not double in MSRP, that I'm pretty sure of but it will give you a nice return when you bought it for the good price. For parting out, it is much less attractive I think. The minifigures will sell well, but you're left then with a bunch of gray pieces and none are that special. If you are a minifig displayer, you'll be happy with this set. If you like pretty SW aircraft, you're better off with alot of other SW vessels. It has nothing special to display.Sure it has a nice cockpit, but the rest of the craft is very mediocre to say at best. And of course the gray colors don't help. I have not even considered displaying it on my desk. I built it, and probably unbuilt it to sell it again hoping that the people who want to buy it didn't read my review and think it's the coolest SW craft they have seen. The set is not that fun to build, not good for display, nor is it good as a playset. It has some nicely designed minifigures but that's it. Of course the figures it has do count, being Emperor Palpatine and Anakin soon to be Vader but in my opinion, it doesn't save this set. It will probably have very modest returns for it's further EOL span. I don't like the set and from all the sets I have build and reviewed so far, this one I like the least.